"The Libraries devoted to the Commons are similar in design and general arrangemetn to those appropriated to the Peers. Like the latter, they are four in number, and occupy some 200 feet of the River frontage. 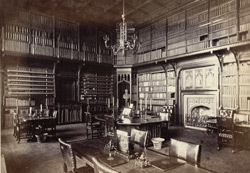 They are replete with every convenience; well-furnished shelves extend from the floor nearly to the ceiling; rollers, with maps of all countries are ranges around; the recessed windows, looking towards the Thames, afford convenient retiring places for study; the thick carpets, manufactured (as indeed is every detail) expressly, and from the designs of the architect, prevent noise, while a most pleasant smell of Russia leather pervades the atmosphere. The result, as may be imagined, is a marvel of comfort and convenience."